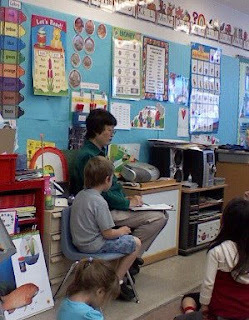 I happened to be in Benjamin's class today as his teacher interviewed him for a special project. The children in his class get to write a few sentences about Ben (favorite food, favorite dessert, favorite ride at Disneyland, etc.) and then draw themselves with him, and then on the back they write something they like about him. The teacher then binds it all in a book, which he gets at the end of the year. I was really impressed with how hard the children were working on this! Perhaps because Ben was the first person they were writing about, they haven't gotten lazy and bored with doing it over and over. I was also very touched by all the kind things the children were saying about him. As a parent to these two particular boys, I've found people are very quick to tell me about all the rotten things they've done. Kindergartners are notorious tattlers as well! It was nice to hear 20 small people telling me about how terrific Benjamin is. It was so nice to hear! During the interview I discovered two things about Ben that I did not know before. His favorite shape is a square, and his favorite planet is Mars. Sounds like there should be a joke in there somewhere, huh?